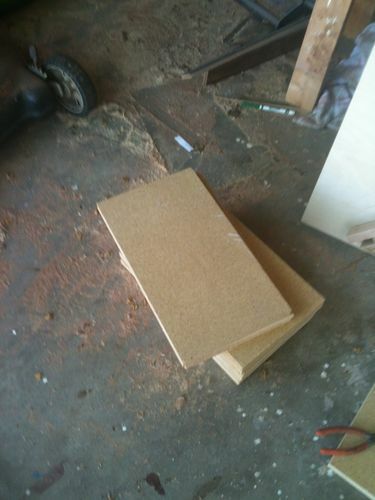 I looked down at the hunks of particle board with a contemptuous sneer. There was just no way this junk was ever going to be of any use. I was ready to throw it out but my contempt for the worthiness of the particle board aside, it felt irresponsible to burden a landfill and throw out a resource. Yesterday, I was collecting tools from my office renovation project and didn’t really have a place to put them other than back in the tool chests where they belonged. Except – I’m not done with the renovation and I need all the tools right in the office. The wheels turn awful slow sometimes but they do turn. I got the idea to just slap all the pieces together and make a few tool totes. Big deal! That is certainly not a LumberJock worthy project. In fact, we like to keep little builds like this to ourselves. 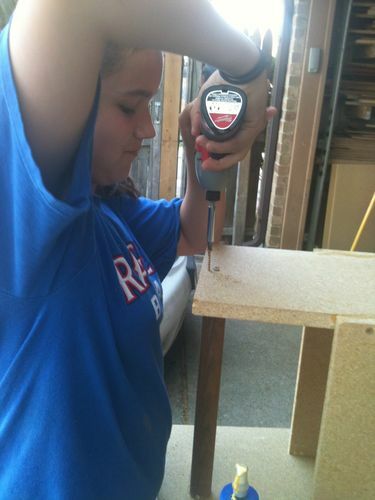 Unless of course, It happens to be the very first project a 13 year old daughter started and finished all by herself. 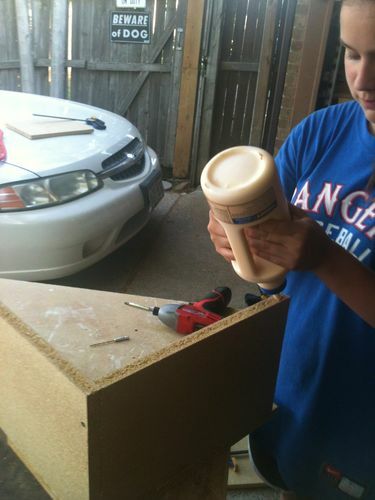 This is Victoria’s first project. She compared all the boards to each other and made sure they were very close to the same size. Victoria dry fitted the boards together and found that the bottom boards needed to be cut a little shorter so the tote bottoms would fit inside the tote sides. 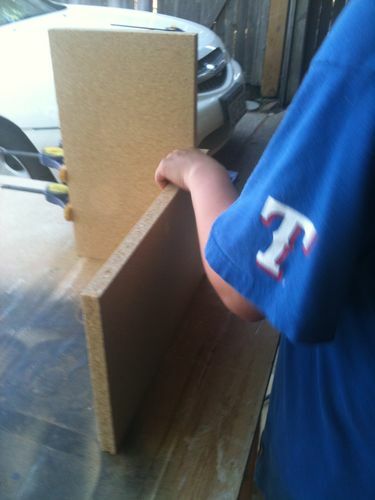 She learned a quick little trick for measuring how much material she needed to cut off the bottom boards. Yep – two thicknesses for a quick check and she set the fence. Rippp! Victoria thought it would be great to have some extra hands while she set the screws. Clamps! And the rest of the story through pictures. If you don’t ask me where I got the particle board offcuts, I wont have to confess that I installed PB shelves in the tiny walk in closet attached to my office. It will save me the embarrassment. The tote handle Victoria installed in the last picture came from the clothes rod that used to be in that closet. I didn’t want to break the original post by showing what pure ugly looks like. Gentlemen – be glad you don’t look like this. Ladies – be glad you’re not married to it. Just ultra cool—congratulations all the way around. Best wishes for a very happy Father’s Day, and remember to be kind to yourself—you’re rearing a great little lady. 2 mighty fine looking Totes, ...and you’re a fairly good looking Toter. Happy Father’s Day Mark, you are a Lucky Man to have such a go getter for a daughter. 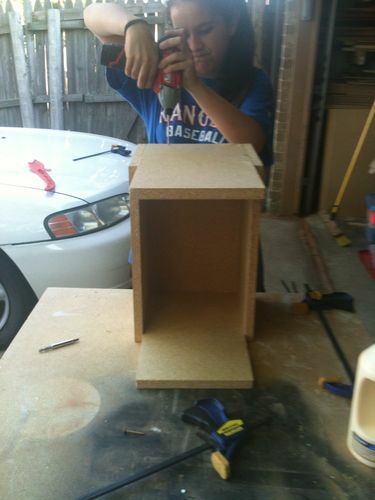 Victoria did a wonderful job on her first project! 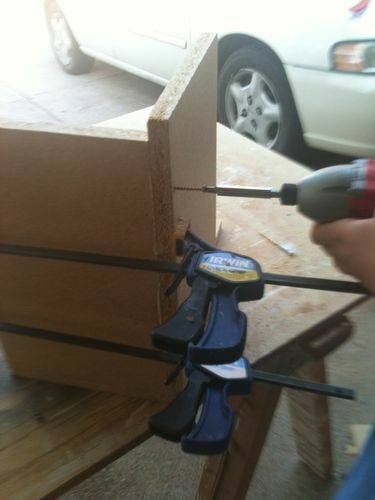 Glued & screwed like a real pro! Nice work by your lovely daughter Mark and very useful too. My Congratulations to your very Talented and Lovely Daughter Victoria. I’m sure Your Father will Love them knowing who made them for him. They are also a Very Worthwhile Lumberjocks Project! 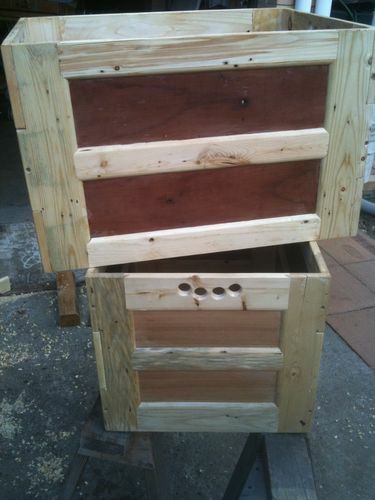 A excellent effort and result, I did the same for a couple of tote boxes for my Ute. I also disliked loading then unloading gear all the time so that was what inspired me to make them. 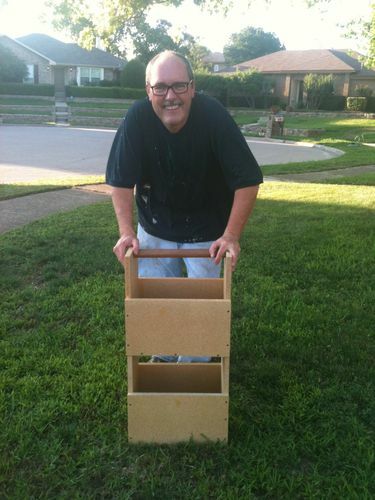 A bit “Over the Top” fabrication wise, but I had the materials, time and tools to do it !! Not the sort of load a cute young lady would look good with though !! yours are more suitable !! Well done…and I love Victoria’s shirt! 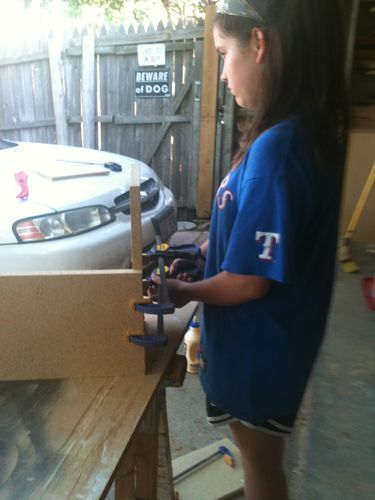 Good use of that particle board and nice to see you daughter getting in the shop and making such a nice fit for you!! They are real nice in that they stack too. She did a great job ,keep on smiling . 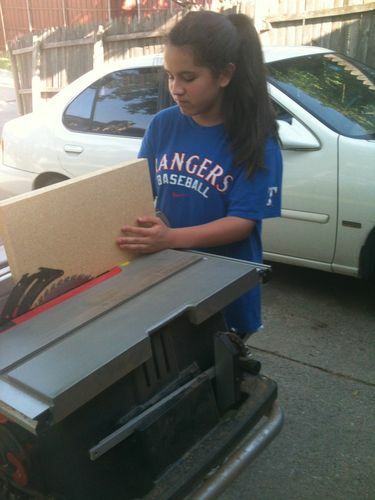 Out of my own curiosity though as I’m still fairly new… Isn’t the picture of her using the tablesaw dangerous? I was tought to never push material through like that. Wouldn’t the material get pinched between the fence and blade if she pushed too quickly and kick back? I have had material kick back at me twice and it was my own fault from pushing material through the left side faster than the right side. I quickly learned when I had a 1×8 plank of hard maple slam me in the business at 100mph. Hey everyone! You all are the greatest! Thank you so much for pouring into Victoria. although she won’t say much about it, I know that you all are very inspiring to her and she loves reading your comments! I’m going to try to see if she will set up her own LJ account. Thank you so much for your concerned post! I’m going to say that I agree with you. It would have been better to set the fence on the wider side and not used the quick measurement trick. 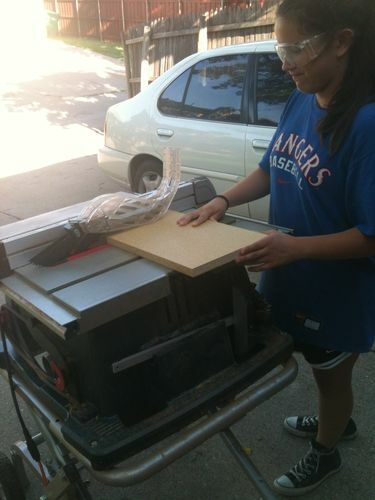 What I directed her to do correctly was unplug the saw when she set the fence. After the fence was set, I directed he to install the guard and anti-kick back. Only the did we plug the saw back in. As you can see, she is wearing googles. Before she cut her boards, I ran a trial cut and it seemed fine. Not really good enough. I’ll make sure I correct what I showed her on the next go around. I’m also going to pull out the the particle masks. Sometimes we get lazy and say – it’s just a quick cut. Well I’ll count that one as an opportunity for Dad to be a bit more conscious and responsible of what he is showing his little princess. Again – thank you! You’re on the money. Rob, those totes are definitely over the top and super awesome. I really like the joinery. Those totes look super sturdy and it would probably a bomb to mess up those corners. I can’t tell from your pictures but you probably cut a rabbit to support the bottom. What really tickles the heck out of me are the grips. That’s an extraordinary measure of coolness. My only second thought about them is they might be finger breakers if you tripped while carrying the totes. I’m sure you have that well covered.